Twisted Dune Golf Club is like no other golf course in New Jersey. True to its name, Twisted Dune is a links style course with twisting landscapes, dramatic elevations, and contoured fairways. Ours is a challenging, yet supremely playable, eighteen-hole design. Deep ravines, towering grass-covered hills, and well over 100 deep traps and bunkers, make Twisted Dune's 7,200 yards a memorable golfing experience for all. Featuring four par 5's at over 500 yards, ten par 4's, and and four par 3's, Twisted Dune GC is the type of course that serious golfers love to play again and again! Yet, with it's many tee box options, Twisted Dune is also one of the most friendly to golfers of every skill level. Twisted Dune offers a visually stunning golf experience that rewards accuracy and course management. 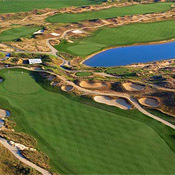 Come see why Twisted Dune Golf Club is consistently rated at the top of every major golf publication's "Best of" list.